Like all of VOCAL’s software libraries, our VoIP stack with Voice Quality Enhancement is available in a variety of forms, including ANSI C and assembly language optimized implementations for leading DSP architectures (including but not limited to processors from TI, ADI, AMD, ARM, MIPS, Intel and others. These libraries are modular and can be executed as a single task under a variety of operating systems or standalone with its own microkernel. The VoIP stack software is available for licensing by developers as a library or part of a complete design. To find out if your platform and processor are supported, please contact us. Acoustic echo, background noise, and reverberation are some of the possible causes for the degradation of the voice signal. VOCAL’s Voice Quality Enhancement (VQE) system is designed to be incorporated with a VoIP stack. Voice Quality Enhancement can significantly improve the quality of conversations by removing echo and background noise. In hands-free applications, acoustics echoes can be particularly inhibiting to a conversation. Acoustic echo cancellation (AEC) uses an adaptive filter to model the echo path between the loudspeaker and microphone. Noise reduction estimates the noise spectrum to improve the overall SNR. 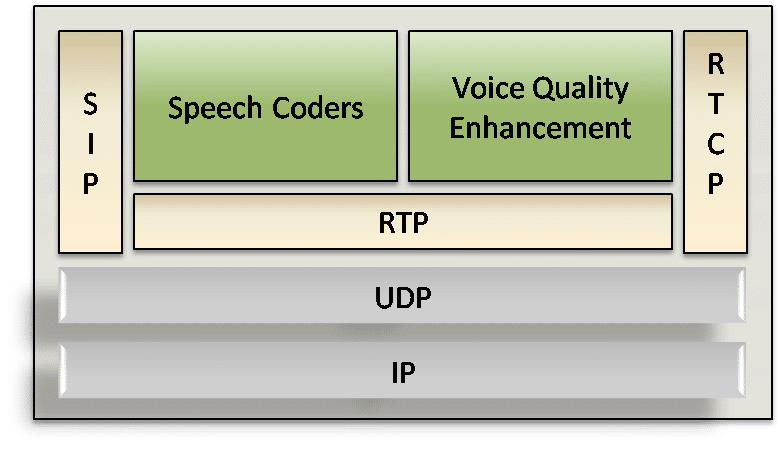 Speech Coders use voice compression algorithms to minimize bandwidth requirements of a VoIP call. They are equipped with silence detection/comfort noise generation to allow for the transmission of silence injection description packets to further reduce bandwidth. Session Initialization Protocol (SIP) is an application-layer control protocol that can establish, modify, and terminate multimedia sessions (conferences) such as VoIP telephony calls. SIP is used for set up, handshaking and tear down of a VoIP session. Real-Time Transport Protocol (RTP) is designed to provide real-time transmission of data such as audio or video over a network. In VoIP, the compressed voice samples from the speech coders are packaged into a payload and framed as a RTP/User Datagram Protocol/Internet Protocol packet.